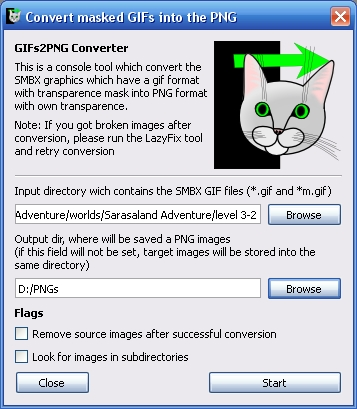 GIFs2PNG - is a converter which create the transparent PNG image from the SMBX64 GIFs pair which using the mask for define transparency. GIFs2PNG - is a console tool, you need open the terminal or command line and change directory to the GIFs2PNG tool. 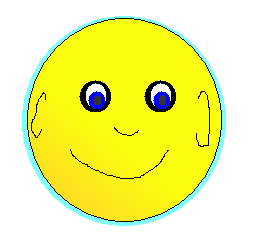 The Editor have a GUI shell for set properties to the GIFs2PNG. For open them, try the menu item: "Tools -> External tools -> Convert GIF with mask to PNG (GIFs2PNG)"
And you can configure properties for setup the batch converting. When you press "Start", will be opened the "Developement Console" window, where you will see the converting process. 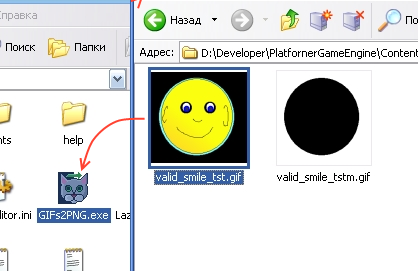 Copyright © 2014-2017 Platformer Game Engine by Wohlstand project.